Binders were in considerable use by the Office of Management and Budget in the 1970s, 1980s, and 1990s. 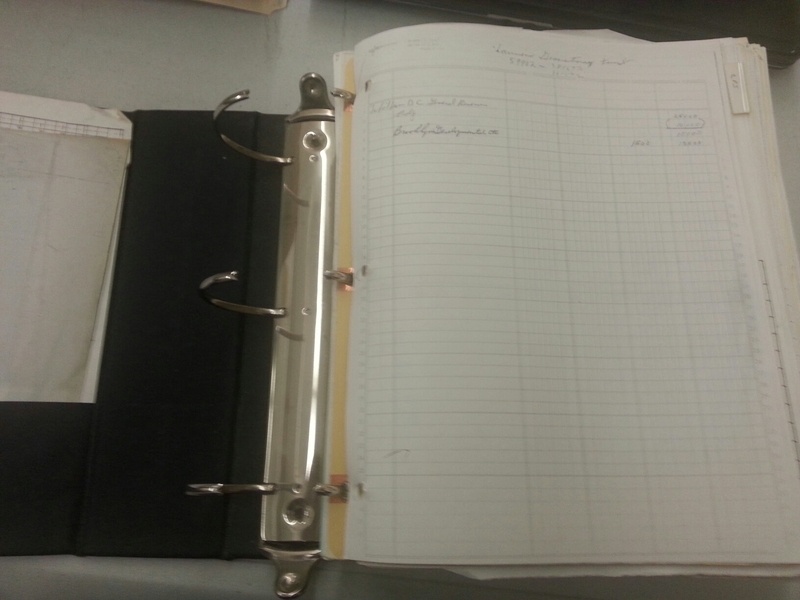 Binders made it easy for the Budget Department staff to file and organize material in a quick and easy fashion. 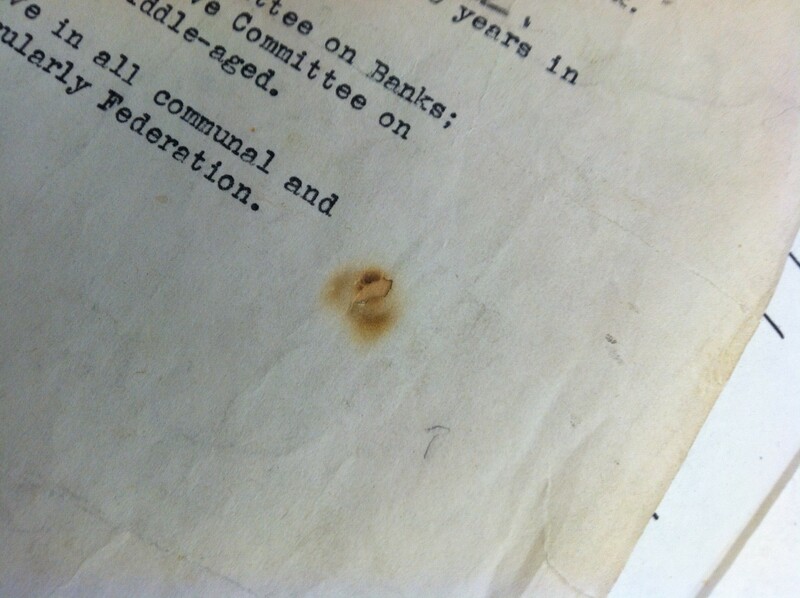 Examples of materials kept in the binders include letters of allotment, grants awarded to UJA-Federation agencies, grants awarded by the Distribution Committee, reserves, chronological correspondence, transfers of capital campaign funds, manuals, and transportation study reports. Some of the binders contain little material and take minimal time to process and transfer to acid-free folders, while the majority of binders are the 5-inch D-ring type full of paper and therefore take more time to process. By organizing the binders in chronological order, we have identified some gaps in the material. We are removing these binders in order to reduce the amount of space this material takes up, and the physical rehousing will be better over the long-term for the documents themselves. The folders are also much lighter in weight than these huge 5” binders. Of the various kinds of files removed from the binders, it may be the chronological correspondence collected by Budget Director Steven Rosenbloom that will be of most interest to researchers, because they touch on such a multitude of topics in the Subject Files. Pictured below is a huge binder, full of reserves from 1988 to 1989. The UJA-Federation (UJF) Budget Department Subject Files are currently being processed, which we anticipate will end up being approximately 40 to 50 linear feet in quantity. 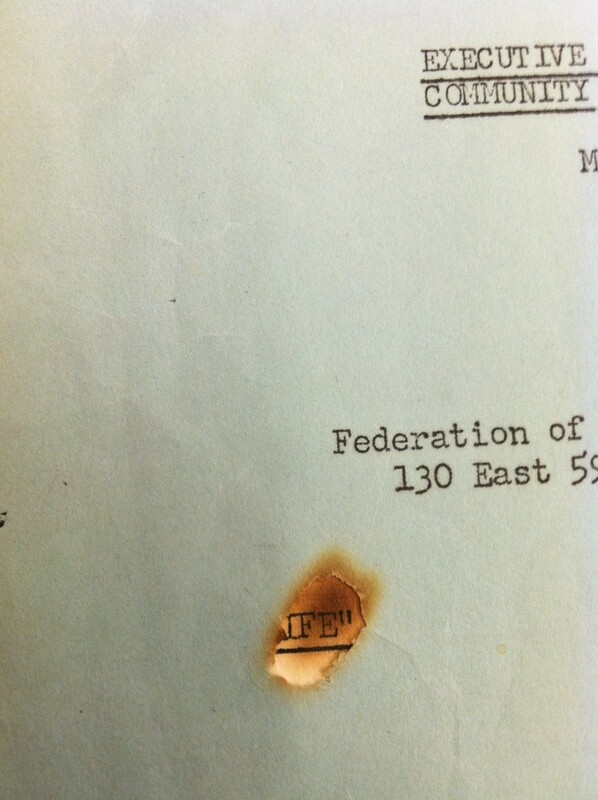 These subject files are the files of the Budget Department (then called the Office of Management and Budget (OMB)) created after the merger in 1986 and are the final subseries of the UJA-Federation budget files to be processed. Two groups of files are discussed below. 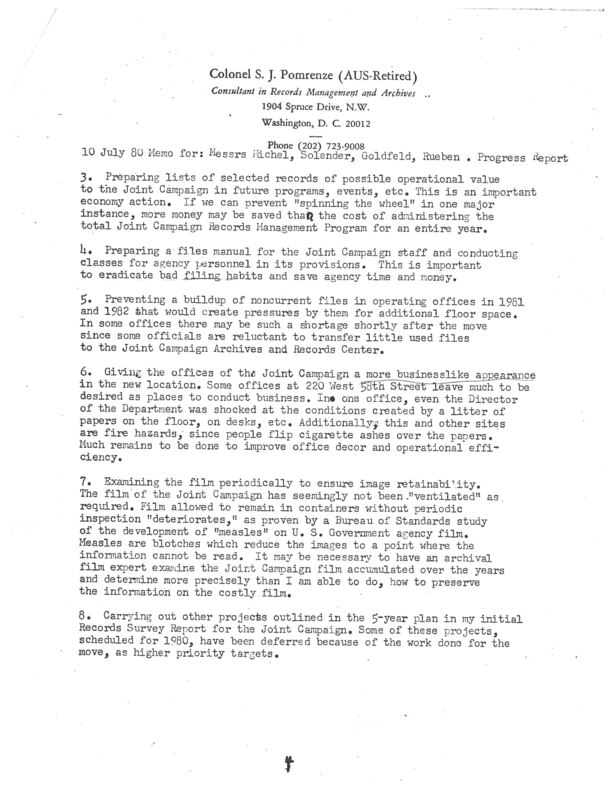 One of the major subject areas within these files pertains to the Capital Campaign. The Capital Campaign was an ambitious $1.7 billion “capital campaign” aimed at building and rebuilding the facilities of its beneficiary organizations. The Capital Campaign Central Fund was established to support capital projects of agencies with limited resources and recognition, approved in accordance with the Guidelines for the Capital Campaign. The Central Fund provided grants to agencies for a portion of the total cost of a project. Grants were provided as an incentive to assure the completion of projects which had received the support of the sponsoring agency’s leadership. The amount of individual grant awards depended on factors such as the nature of the project, the amount of funds available for distribution and the relative demand for funds. The Cornerstone Fund is an ideal opportunity for donors at all giving levels who want to make an important contribution toward preventing the deterioration of critical community agencies throughout the UJA-Federation network. 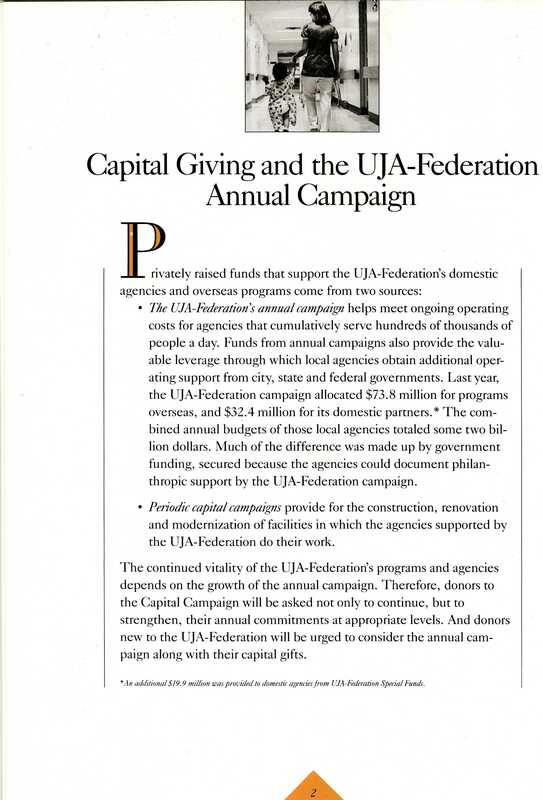 The following image is a page excerpted from the pamphlet, “A Time To Build,” which was a campaign brief for the UJA-Federation Capital Campaign. It discusses how privately raised funds come from two sources: the UJA-Federation’s annual campaign and periodic capital campaigns. It will be interesting to research the differences and similarities between these UJA-Federation capital campaign financing files with the much earlier files that can be found in the FJP Budget Department Subject Files dealing with what was called before the merger the Capital Programming Subcommittee of the Communal Planning Committee, circa 1978-1986; and also of the Building Fund, for which we have records as early as 1919. We will continue to post about topics in these subject files as the processing progresses. 1.) 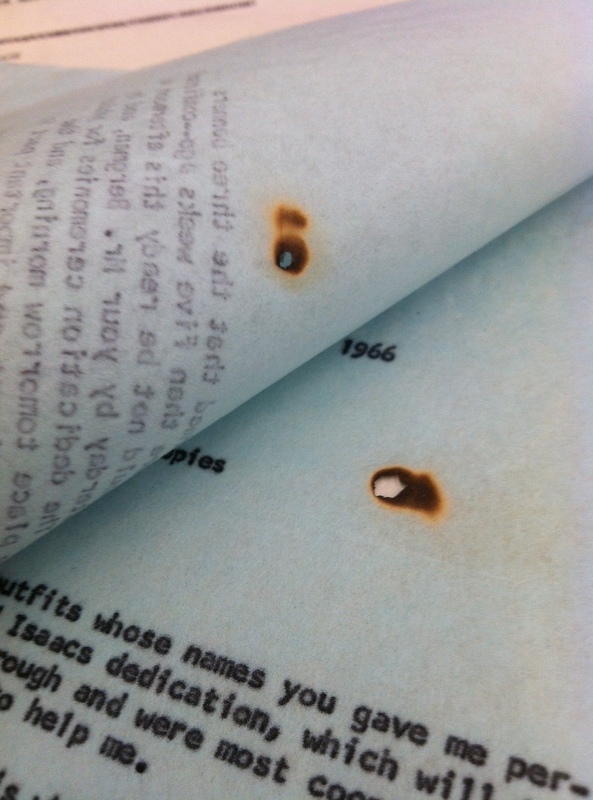 Destroy valueless paper and reduce retained records to the minimum possible space. 2.) Establish a permanent record center at Federation where important records are easily accessible. 3.) Introduce a systematic ongoing records destruction program including standards and schedules. 4.) Develop a systematic program of record retention including criteria for what records are to be retained and how long they are to be kept. 5.) Develop a standard record keeping system for each of the Federation departments and a system for the transmittal of appropriate records to storage in record center. 6.) Establish ongoing effective management inspection and supervision of all records at Federation. In addition to the benefits enjoyed by an institution having a well-run records management program, such as greater intellectual control over institutional records as well as ease of retrieval and access to institutional records, Mancher was particularly concerned about issues of space in light of discussion regarding United Jewish Appeal of Greater New York, the Joint Campaign, and the Federation being housed in same building, years before the 1986 merger between United Jewish Appeal and the Federation. 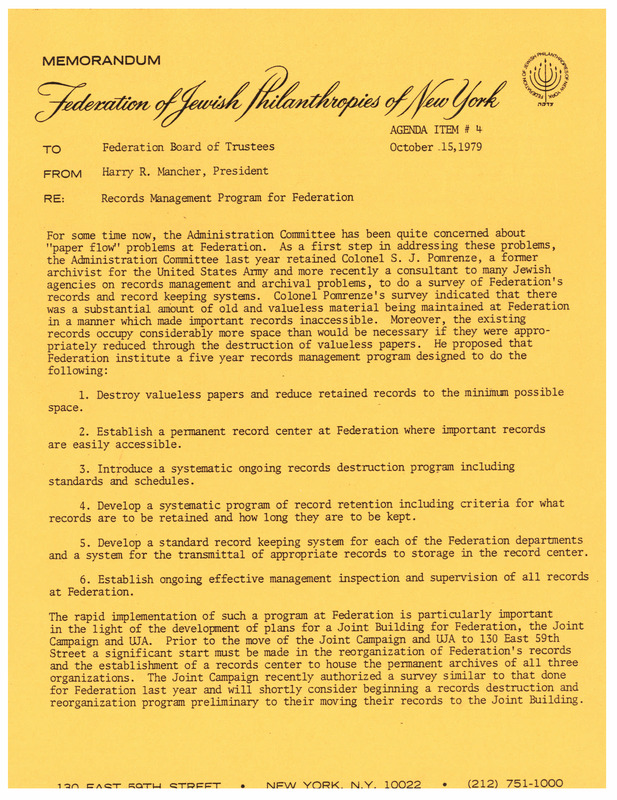 It was also that concern about space, the disposition of important records, and the goals associated with the records management program that have made our project possible, in that, much of what was identified, listed by file folder, and retained as part of the Federation records management program is (or will be) archival processed, described, and (in the near future) made available to researchers. The idea of smoking at one’s desk may seem foreign to most office workers in the United States today, but this was not always the case. Bans on smoking in offices and other workplaces have been widespread in states across the U. S. since the 1980s and 1990s. 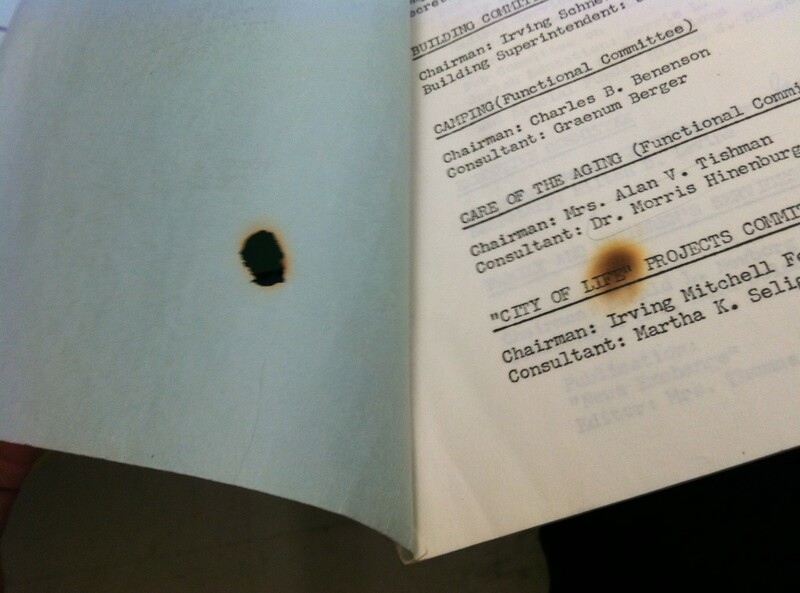 Any institutional archival collection that precedes the 1980s will inevitably hold a few tell-tale cigarette burn marks here and there. 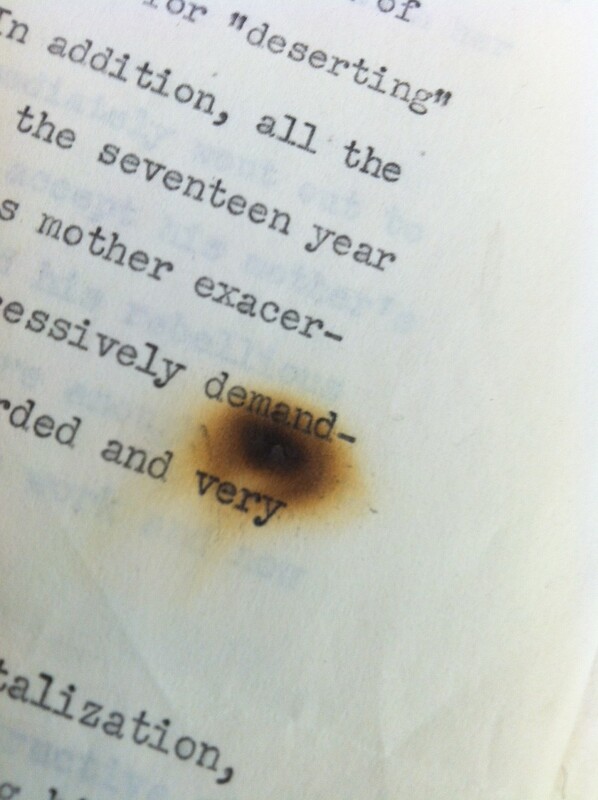 These photos represent just a sampling of some I noticed in the course of processing the Ernest Michel papers and the FJP Public Relations files.